Aldous Huxley was descended from two eminent Victorian families—he was a grandson of noted biologist and writer on science, Thomas Henry Huxley, grandnephew of Matthew Arnold, and nephew of Victorian novelist Mary Augusta Ward (who wrote under her married name Mrs. Humphry Ward), Arnold’s niece. His unusual Christian name commemorates a major character, Aldous Raeburn, in the novel Marcella, which Mrs. Ward published in the year of Huxley’s birth, 1894. Born in Godalming, Surrey, England, he received his first schooling from his mother, Julia Arnold Huxley. He then moved on to Hillside Preparatory School, Eton, and eventually, Balliol College, Oxford, taking a first in English in 1916. Two early blows—the death of his mother when he was only nine, and an attack of keratitis while he was a student at Eton, which left him nearly blind for the rest of his life—may have sharpened his tendency toward introversion. Certainly the latter affliction precluded a career in science, paving the way for a life in letters. In the course of his long literary career, Aldous Huxley published poetry collections, plays, essays, short fiction, travel narratives, biography, and criticism, but, like George Orwell, author of Nineteen-Eighty-four, he is best remembered as the author of a hugely influential utopian satire. Both men used the genre more than once. Brave New World began, like Orwell’s Coming Up for Air, as a response to H. G. Wells’s utopia, Men Like Gods (1923), and Huxley later wrote two more utopian-dystopian novels: Ape and Essence (1948) and Island (1962). 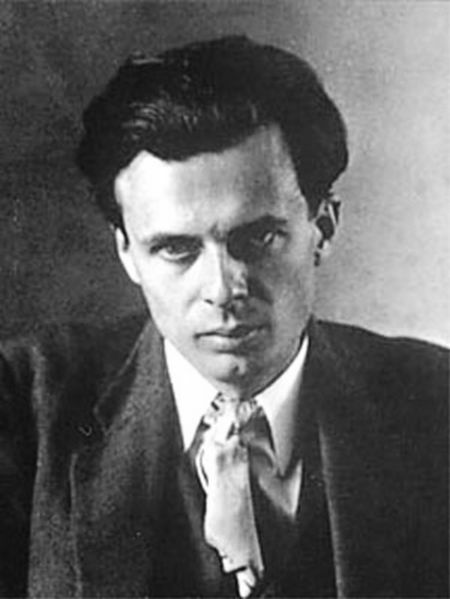 Although Huxley felt that he was not a “born novelist, but an essayist who writes novels,” he became an innovative fictional stylist, effectively using cinematic montage technique for the purpose of exposition in the third chapter of Brave New World, thereby sparing the reader from that major defect of most utopian novels—the tedious guided tour of utopian schools, hospitals, and factories. With his use of montage and intertextuality, Huxley did for the novel what Eliot had done for modern poetry in The Waste Land 10 years earlier. Like Eliot, Huxley often uses multiple references to canonical works. In Brave New World, his 50 allusions to Shakespeare help develop theme. He also incorporates ideas of fashionable Freudians such as Ernest Jones and his interpretation of Hamlet to deepen the sense of the Savage’s sexual repression. At opportune moments, he echoes key lines from Gray’s “Elegy” and “Ode on a Distant Prospect of Eton” to underscore the ignorance-is-bliss theme and key images that recall the Utilitarian schoolroom in Dickens’s Hard Times. Nor does he hesitate to use bathos: the deliberate contrasting of high culture with popular culture—excerpts from fictional advertising jingles and popular 1920s-era romances such as Elinor Glyn’s Three Weeks satirize the contemporary lowering of musical and literary standards. One notes a gradually emerging social conscience in Huxley at the time of his writing Brave New World. In fact, his satiric description of the reified workers in a dystopian factory was based on his visit to a Lucas automotive parts factory in Birmingham the previous spring. In Brave New World, the novel’s most sympathetic character, Helmholtz Watson, like Wordworth on Westminster Bridge, finds the silence of the sleeping metropolis to be eloquent: the very absence of the numinous in the wholly materialistic state begins, paradoxically, to suggest a presence. Watson is one of the first in what becomes a steady string of protagonists in his future novels who advocate what Huxley called “the great central technique, which traces the art of obtaining freedom from the fundamental human disability of egotism…repeatedly described by the mystics of all ages and countries.” His final utopian novel, Island (1962), is, in fact, Huxley’s final word on the subject of how to construct the good society. He died in Hollywood on November 22, 1963, the day President John F. Kennedy was assassinated.